Georgius Joseph Viandrito has more than 15 years’ experience in program management and M&E with various respected institutions, such as ICCTF/BAPPENAS, The UNs (UNDP, FAO, UNICEF, UN WFP, and UNODC), AUSAID, USAID, EU, World Bank, ASEAN, IFRC Asia Pacific, Edelman Inc., and other international institutions in Indonesia and Asia. Previously, he served as PROJECT MANAGER at Asian Disaster Preparedness Center (ADPC), Thailand, as Hub Coordinator/Team Leader at ASEAN (Association of South-East Asian Nations) Humanitarian Task Force, in Myanmar, Director at Indonesia Climate Change Trust Fund, Chief of Party of a USAID project called “Climate Adaptation and Disaster Resilience” (CADRE), and Program Manager at UNDP for “Integrated IDPs Settlement and Development Programme in Sulawesi. He has proven experience in carrying out evaluations of regional programmes, with proficiency in qualitative research methods and in particular on thematic issue of climate change and disaster risk assessment. Some of related jobs are: Managed the Periodic Review Assessment in Myanmar, Evaluation Expert at UN FAO, Evaluator for European Union/The Commission’s Humanitarian Disaster Risk Reduction Activities (DIPECHO), NORAD, USAID projects and others. He is Doctor Candidate of Environmental Science in University of Indonesia. He earned his Master degree in International Studies and Bachelor degree in Economics Science. He got International Certificates on Tsunami Science and Preparedness, from University of Washington & AIT Bangkok, and a certificate on “USAID’s Rules and Regulations: Grants and Cooperative Agreements” in Vietnam. 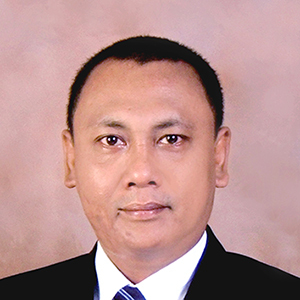 He join Research Center for Climate Change – University of Indonesia (RCCC-UI) from 2018 as research associate.